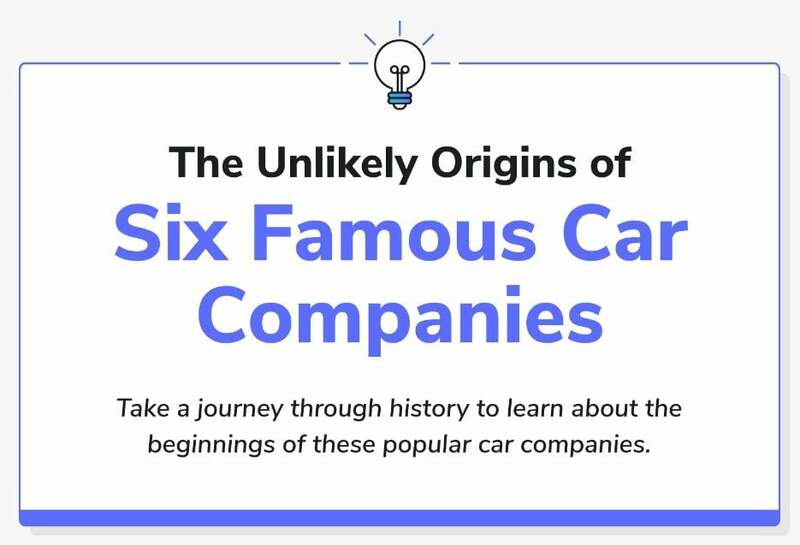 The Zebra has created an infographic that tells the stories of six famous car companies and how they started. Before they were multimillion dollar companies with thousands of employees and international offices and sales, these companies started with the creativity of entrepreneurs who had big dreams for the future. Among them, you’ll find the origin stories of some of our favorite car brands: Aston Martin, Jeep, Mini Cooper, and Lamborghini just to name a few. The founders of these companies experienced challenges from the start, but they chose the path of innovation and imagination to build their companies from scratch. As a result, their products are a daily part of our lives and are recognizable around the world. Giovanni Agnelli, an influential Italian industrialist and entrepreneur, went in with several other investors to create the Fabbrica Italiana Automobili Torino, or ‘Fiat,’ in 1899. With roots in many areas of manufacturing, the shareholders of Fiat combined their knowledge and creativity to begin producing automobiles. Over the following decades, Fiat introduced more models to their production line, including passenger cars, trucks, and engines for both marine and aircraft. Over time, Fiat began to decentralize operations and began acquiring other automotive brands including Maserati, Aston Martin, and eventually full ownership of Chrysler. This created a multinational company operating in more than 140 countries and employing almost 236,000 people. Robert Bamford and Lionel Martin founded Aston Martin in 1913 as of Lionel Martin’s successful race at the Aston Martin Hill Climb in England. As with many startups, the company saw financial problems throughout the following years and was even forced to close in 1925. After being rescued by a group of investors, this newly-minted company saw success with a range of sports cars and a growing reputation for performance and engineering. In 1964, the iconic relationship between Aston Martin and James Bond was formed when the DB5 was featured in the Bond film ‘Goldfinger.’ In the following years, Aston Martin underwent more changes in leadership, but the brand retained its image as “the car” for James Bond. Today, the Aston Martin is viewed as a high-precision vehicle, known for its speed, detail and strength. In 1920, Toyo Cork Kogyo Corporation was founded in Hiroshima, Japan. The company produced cork to supply the Japanese army during World War I. In 1921, Jujiro Matsuda became president of the company and began instilling changes when demand for cork dropped off after the war. The first of these changes was to the company’s name. ‘Mazda’ was representative of both the president and Ahura Mazda, Zoroastrian god of light. By the 1930s, Mazda was manufacturing a three-wheeled pickup truck called ‘Mazda Go.’ After World War II, Mazda continued production of more vehicles, increasing their range and functionality over time. Eventually, Mazda was introduced to the United States and became successful as an international company. In the past decade, Mazda has become an icon for innovation in the face of failure and has set the standard for competition in the automotive world. In the early 1940s, the American War Department put out a request for the creation of a small, rugged reconnaissance vehicle to be used in World War II. Only two companies answered the call: American Bantam and Willys-Overland. Designed in only 18 hours, the Bantam vehicle, nicknamed ‘The Quad’ for its four-wheel drive, exceeded expectations. Willys-Overland and Ford Motor Company used the Bantam prototype as a guide to develop more prototypes. More than 637,000 vehicles were built by Willys and Ford for World War II. The Jeep Wrangler is the ancestor of these vehicles and has become an American icon. After the war, the vehicle’s transition to civilian life was plagued by changes in ownership and company instability. It wasn’t until Chrysler introduced the Grand Cherokee by driving it straight through plate-glass at an auto show that the Jeep finally became popular. Jeep has set a record for global shipments in the last decade. Today, the Jeep is a symbol of American ruggedness and is recognized around the world for its unmistakable appearance and personality. Another company created as a result of World War II, Mini Cooper came into existence in 1957. The Suez Crisis sent the price of fuel soaring and the large vehicles popular in civilian England were becoming expensive to fuel. Leonard Lord, an automobile manufacturer in England, decided to come up with a solution to the crisis. He tasked his engineers with the challenge of building a small, fuel-efficient vehicle that was affordable to nearly everyone. To complete the challenge, engineer Alec Issigonis conceptualized two innovations that would become standard in Mini’s later in time: creating more room in the cockpit by pushing the wheels to the corners of the chassis and turning the engine sideways to create more stability. The world had never seen a vehicle like it. When the first Mini was launched in 1959, it was met with mixed reactions. However, it quickly became known that the Mini was not just a car. It was the epitome of British style in a small, low-cost package that became popular with the youthful culture of the 1960s. Though it filled the needs of the public as an economy car, it also became known for its performance on the race track. With its go-kart-esque stance and agile handling, the Mini did remarkably well under speed. In fact, British racing legend John Cooper tweaked his Mini, modifying a few areas to create the Mini Cooper 997, a rally demon at the time. Today, Mini Coopers are used globally and are proof that innovation in a time of crisis often produces the best results. Ferrucio Lamborghini, an Italian industrialist during the 1960s, owned a tractor-manufacturing company that was seeing great success. As a result, he decided to reward himself with a Ferrari sports car, the pinnacle of Italian supercars at the time. However, he experienced problems with his Ferrari immediately. When the clutch of his new car proved finicky, he had his tractor company engineers create a solution. He then called Enzo Ferrari to offer his solution. Understandably, Ferrari was insulted that a tractor maker dared tell him how to design his sports cars, so he sent Lamborghini on his way, insisting that he focus on his tractors and leave the sports cars to the experts. Instead, Lamborghini decided to one-up Ferrari and returned home to begin designing a sports car that would blow the Ferrari away. The first Lamborghini, a 350GT, was well received at its introduction in 1964, but it wasn’t until the introduction of the Lamborghini Miura at the Geneva International Motor Show in 1966 that Lamborghini grew its supercar wings. After changes in leadership and additions to the product line, Lamborghini is now a massive corporate subsidiary of Volkswagen Group, but its spirit of defiance and speed are unchanged. Lamborghinis are seen as true supercars, visions of elegant design coupled with unbridled power.